China’s car market is just gearing up as the world’s largest, yet automakers are already eyeing the next big thing — the market for reselling them. 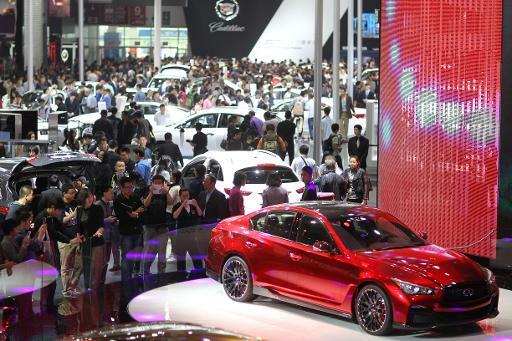 Their eagerness to attract buyers in the world’s largest car market is on full display at the Beijing International Automotive Exhibition, which opened to the public on Monday with more than 1,000 vehicles on show. Motor enthusiasts crowded around the displays with their spouses and children in a festive atmosphere to seek inspiration from the new models, while executives representing brands from across the globe also made appearances at the show, China’s biggest. China has become a vital market for foreign brands as business in other regions flags. Yet the boom in sales — which last year rose 14 percent to 22 million vehicles — only took off a decade ago. And the nation only overtook the United States in 2009 to become the world’s biggest auto market. With such a brief period for new cars to hit the market and for China’s still-expanding middle class to make the costly purchases, the second-hand market has yet to develop. Also lacking is the necessary infrastructure such as dealerships and, in particular, guarantees of quality. But by setting up the systems to provide such assurances, automakers hope to win over second-hand buyers and sellers who have otherwise largely resorted to doing informal deals among themselves. “This is a massive new car market in China, which creates a bywave of a pre-owned car market as well, so all our retailers should be ready for this,” said Andy Goss, director of group sales operations for Jaguar Land Rover. The second-hand market is “a fundamental part of our footprint”, he added. Jaguar Land Rover is setting up the systems needed to support such a market, including insurance, vehicle checks, presentation standards and marketing, Goss told AFP. At present used-car sales in China lag far behind new ones, although estimates are rough because of the large informal market. Only about 35 used cars were sold in China for every 100 new ones, compared with a far higher ratio of 270 old for every 100 new in the United States, said Dominique Boesch, head of the Audi sales division at FAW-Volkswagen. The key is to convince buyers that a second-hand car offers as much reliability as a new one, said Frederic Banzet, director general of Citroen, adding that the French automaker planned to provide such assurances. “We explain to them that these vehicles have been checked,” Banzet said. Volvo CEO Haakan Samuelsson told AFP that the company aims to bolster its maintenance and inspection systems to give confidence both to second-hand buyers and sellers. “It’s a key factor for the customer: how much do I get back when I sell it?” Samuelsson said. The company wanted to make a two-year-old Volvo more attractive than a brand-new but cheaper alternative brand, he said. Posted in Automotive and tagged bcg, deloitte, mckinsey, Strategy.